When I found out I was having my 4th boy last year I knew I needed some projects for the new baby since there was nothing to buy. A girl’s got to have a little fun getting ready for baby right? 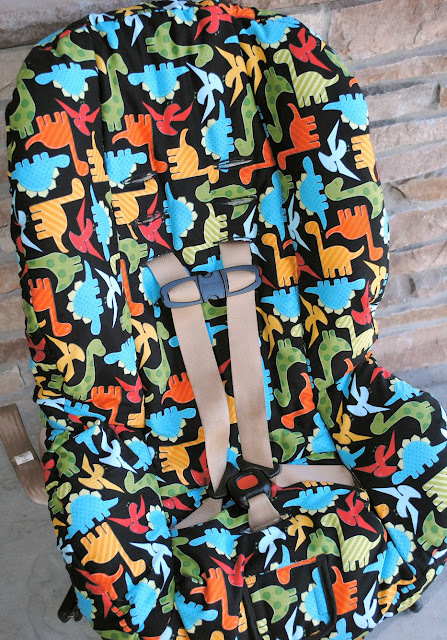 One of the projects I came up with was to recover the infant car seat by covering the existing cover with cute fabric just because it was old and dingy and it would be fun to give it an upgrade. Now that he is about to move to a toddler car seat I decided to recover that too. And you might recognize this fabric. I used it for this project too. I just really love it. Plus, it should hide the dirt well. Here’s the infant one from last year. I’m going to teach you how to cover a baby car seat using the existing cover. OK, first of all, this isn’t too terribly hard, but it’s not super easy either. It took me probably at least 4-5 hours of sewing and it didn’t turn out perfect. But it looks really cute when it is all done. 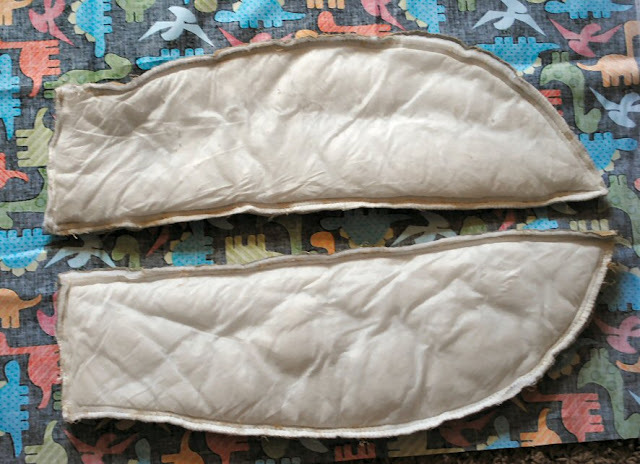 You are going to do this by using the existing cover and sewing the new fabric right over it. Then, take off the existing car seat cover and wash it and dry it. Now, grab your seam ripper and a good movie, because the next part is going to take a while. It’s probably the most time consuming part. 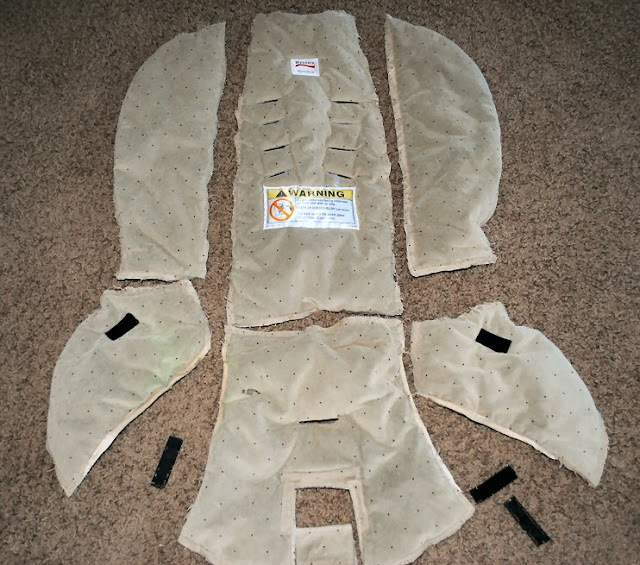 Again, take a good look at how your seat cover is pieced together and memorize it so that you can put it back together. Pick apart each and every piece of your car seat cover. This includes removing all bias tape edges and everything. Like I said, it could take a while, so settle in for the long haul. A good idea is to mark your pieces as you take them apart so you remember where they go when you are done. You can just write on them with a marker. Cut around them just the same size that the car seat pieces are. Do this for each piece of your car seat. 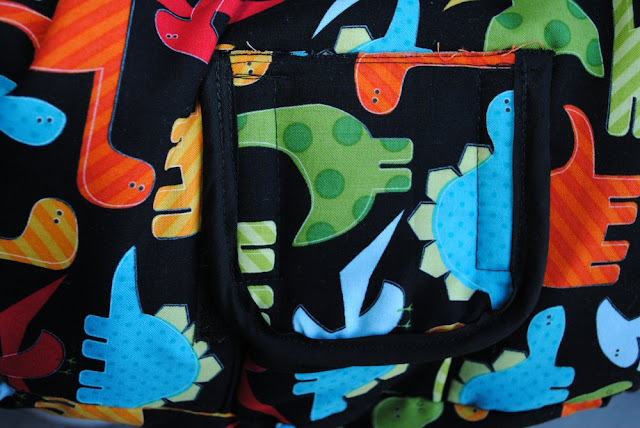 Sew all the fabric pieces onto the car seat pieces. For the seat belt slots do a button hole. I flipped it over so that I was working on the back of the car seat. Do a tight zig zag on either side of the hole, then cut the hole open. 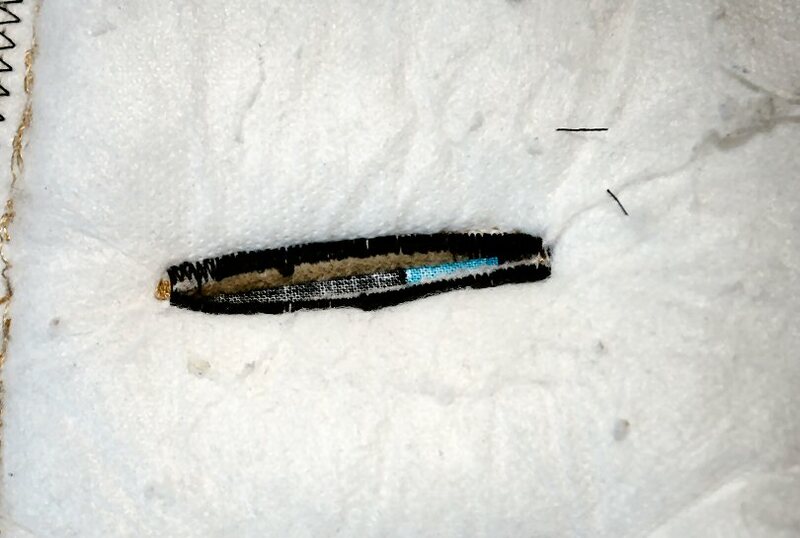 Replace elastic anywhere that needs it. So basically you are just taking the whole thing apart, putting new fabric, bias tape, etc. on it and sewing it back together. My one caution (other than making sure to remember how to put it back together) is to be sure to use the same seam allowances that your original car seat cover had. I didn’t do that super well on this toddler one and it came out slightly too small and it was a little tricky to get it back on the car seat. It worked, but next time I would be more careful. He likes it! He started squealing with glee when I put him in! I looooooove that fabric! So cute! I’ve got a few boosters that might be getting a makeover soon. Love it. Looks wonderful! I am going to share this with a friend, she will love seeing this. This is FABULOUS!!!! I really should try this.. Emanuelle’s car seat cover is so ”blah”! You have the cutest projects! My son would go bonkers over the dinosaurs! Thanks for sharing at the Pomp Party! Pinning to our Pomp Party board! I simply love this fabric!! I have been wanting to do this for so long…She’ll probably grow out of her car seat before I get around to doing it..LOL.. Thanks for the inspiration and tutorial and thanks so much for sharing this @ Fantabulous Friday! GREAT JOB!! much cheaper than buying a new one too!! I just love that fabric! Thanks for sharing at homemade by you! Awesome job!! So glad I found this! We are in the process of adopting a third child and would love to make a new cover when we get out little one! Found you on 504 Main! You are so brave to take apart your car seat cover. It looks so cute! I have always wanted to do this but have never been brave enough!! I love your cute fabric. A million times better than the original car seat cover! Thanks for sharing at oopsey daisy! Wow this is amazing! I would love to recover ours but I don’t know if I’m brave enough. ;-) Great tutorial though! I’m pinning it! this is SO cute! however, many carseat manufacturers void any “warranties” (etc.) if you alter the original cover and/or use after market products! (I know this, because I’ve contacted some in the past) Their main thing is that carseats are tested as “original” (the way we buy them). Thanking you for linking up to my craft, create and inspire linky party….. I hope you will stop by and link up another fabulous project, this weeks party is now live. i did this many times with car seats and infant seats because the covers were just so unattractive and fabric rough. makes this a fun car seat cover. Perfect for an upgrade – congrats on gawker! This is beautiful! Thanks for linking up on Naptime Delights! Color me SUPER impressed! That fabric is adorable too! Thanks for linking up! At Saddles Inc – we assurance that the Clients always gets a excellent Products Manufacturers of Seat Cover, Steering Covers, Sofa Furniture, Car Seat Cover, Gear Knob Covers, Seat Cover Suppliers in Bangalore, India. Seat Cover, Car Seat Cover, Steering Covers, Sofa Furniture, Gear Knob Covers, Seat Covers, Car seat covers, Manufacturers, in bangalore, India. I’m way late on this, I just found you. Adorable projects! However, recovering seats like this is simply NOT safe. It voids the warranty of the car seat, and you are covering up flame resistant material that will help protect you child in the event of a fire. You are altering the car seat from the original form that it was tested in, by doing so, you have no way of knowing how the seat will perform in a crash. I was thinking the same thing. Thank you for saying this Kim. I love this! I did the same thing to my daughter’s car seat to make it work for my son but I think yours came out much cuter. Thanks so much for your directions! I just finished one for my soon to be Granddaughter! Turned out adorable! I think I got that at http://www.hypernoodlefabrics.com My favorite online fabric store! I’m going to start tonight on covering the nice front facing/booster seat for my Bug Boy (some mice decided to nibble at the original cover while in storage….) with some BOY-ISH bug fabric! You have no idea how hard it is to find non- ladybug/butterfly bug fabric! I’m really excited to try this! Is there a link where we can share our finished project with you? This is so dangerous. Absolutely anything after market which comes between a child’s body and the back of the car seat and straps voids the car seat’s warranty, and heaven forbid you have an accident, voids your insurance also. Spreading information on how to make a product like this is putting thousands of innocent moms at risk who are unaware of this. This post should be removed from your blog, or at the very least, edited to add a disclaimer alerting readers to the fact that adding s cover like this will likely void their warranty and jeopardize their insurance. I’m going to leave this comment up so that others can read your concern but this is certainly no more dangerous than letting your baby have a blanket in the carseat. Warranties mean nothing in relation to safety. A warranty does not mean that the baby is any safer. The fabric you buy is not flame retardant in the way manufacturer car seat fabric is, even if you buy flame resistant fabric (like for curtains). A few minutes of flame retardancy can mean the difference between life and your baby burning to death. The fabric you buy may not be of the same quality, thickness or durability that your car seat was tested in, thus nullifying the crash testing and potentially harming your baby. 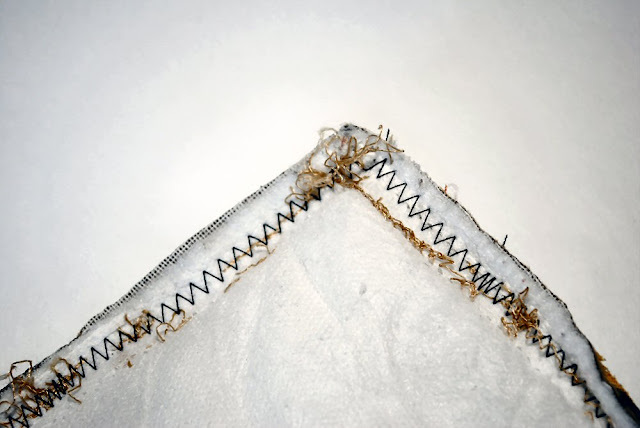 The seams and thread may not be of the same quality or durability either. It voids most insurances. If your baby was seriously injured and they find you were using an after market car seat cover, they will not pay for medical services for your child. It’s just not worth it, even if they are super cute. No, flame retardants are the real danger. Please do some research on PBDEs and their link to hormone disruption, lowered IQ, fertility issues, cancer — the list is endless. Not to mention the fact that they make fires more dangerous by increasing the amount of carbon-monoxide, soot, and smoke in the air — all of which are much more likely to kill you than burns. And these toxic chemicals are in every American baby item you can imagine (cribs, high chairs, bouncy chairs, nursing pillows, changing pads, etc), as well as adult items (couches, mattresses, carpets). Our bodies are being so flooded with this crap, that it’s even found in breast milk. This is the reason people like me are thankful for tutorials like this. I’m so frustrated that there is not a single car seat or booster seat without these chemicals in them. The last car seat I bought had such a strong chemical smell, that I had no choice but to buy an “after-market” car seat cover. There was just no way I was going to let my child breathe that in and touch his delicate, thin skin every day. Incidentally, wool is a natural flame retardant. So if you’re really concerned about slowing down a flame, that is a great material that you might consider using. I personally love the idea of recovering and as for the flame retardant if it must be. Worst case get the fr spray from the fabric store and spray it down. Now it’s fire retardant. I use this spray on fr clothing fixes for SO. and it’s by FDA standards. Oh please. I keep seeing you and others writing this. I get the authors disclaimer. You make it seem like a you can’t have a clothed child in a car seat. You make it seem, dear lord don’t wash the cover either cause you may decrease the integrity of the fabric. It’s just fabric, not a structural element, As long as you don’t mess around with the structure of the seat or seat belts and buckles you’re fine. All she suggests is re-clothing with a super thin fabric. It’s not as if she’s consulting to put your kid in the car seat with a huge puffy jacket that can compress significantly enough a child could potentially maybe with an off chance not be held in the seat in an accident. Stop with silly posts. She makes it abundantly clear in her disclaimer. No need for fear mongering. This is fantastic! 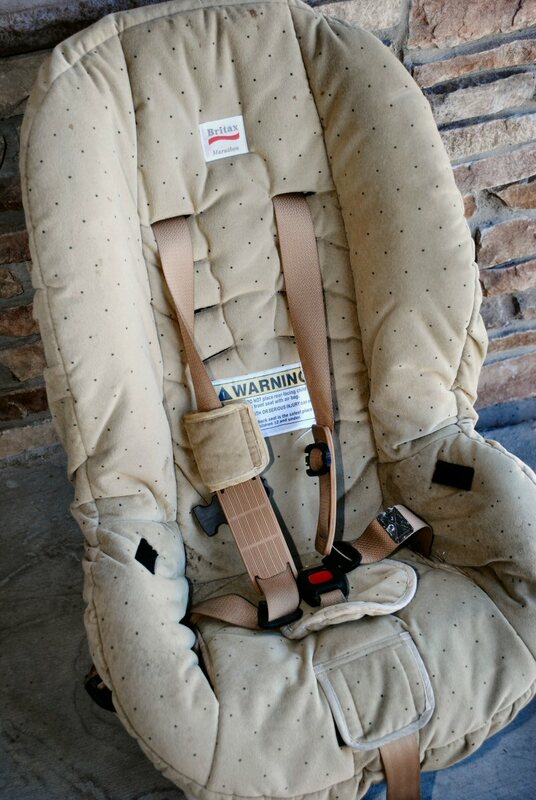 I have an older toddler car seat that is out-dated by regulation standards for use in the car. I was going to recover it so my little man could use it as a seat in the livingroom. I’ll probably try to add more padding, so that it’s extra comfy, so I should probably cute the pieces a bit bigger to allow room for the additional padding, right? Also, in regards to the previous comment, I would agree that if someone just made a new cover, with no regard for the measurements and strap placement of the original cover, that it could be a bit hazardous- but this details that you’re measuring along with the exact pieces of original cover. It’s just like buying an alternate cover for your seat at the store. If it was a hazard, it wouldn’t even be an option to replace. Basically, calm down. I just used normal cotton. But you could use anything. HI Amber. Thank you for the tutorial. I did this last weekend and it turned out great. My daughter who’s name is also Amber just loves it!! Thank you for this tuto ! I was so afraid to do this, and your example had help me… (sorry if i made mistakes, i’m french). I love your blog, i fund you very inspirating ( is it correct ?). I was looking for a pattern to replace a cover on a car seat that my mother in law gave us. It is the exact same seat!!! I’m going to try it in a few days. I’m so excited now! Thanks for the tutorial! I was initially concerned not about the warranty, but getting fire retardant material. For moms concerned about this, you can buy a spray. However. I think people are also forgetting or unaware that fire retardant chemicals are known to be carcinogens and skin irritants too. Some children get rashes from regular car seat covers. 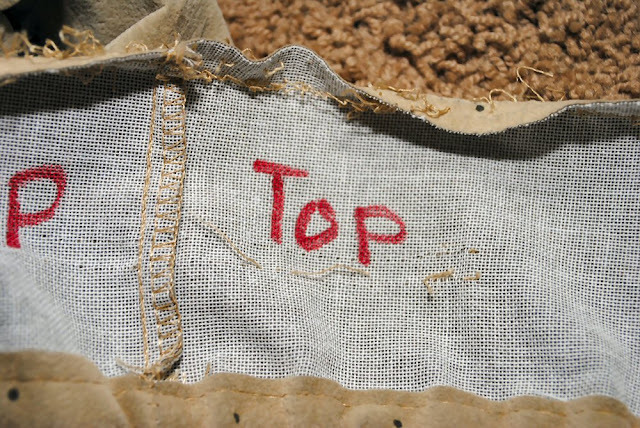 (That’s why there’s a market for organic fabric). 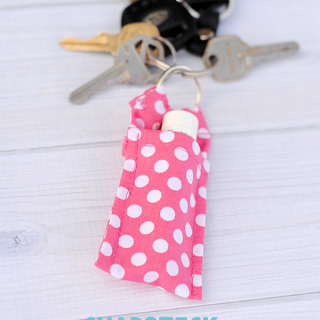 Everyone has different comfort levels… I personaly chose to skip spraying my new diy carseat cover with the spray. Thank you for the tutorial again. I’ve been looking for that multi colored bubble pattern so I can make a shopping cart cover. Does anyone know what it is called? I’m thinking that while it’s all taken apart i would also cut a paper pattern and mark each piece so i could make another one down the road even if it’s for a baby gift for someone else. Just need to make notes about the padding that was used as well as pictures. I’m getting ready to make a Highchair cover as well and will do the same. As for the flame retardant…you can always check the specs on the fabric you choose to see if it has any flame retardant rating. 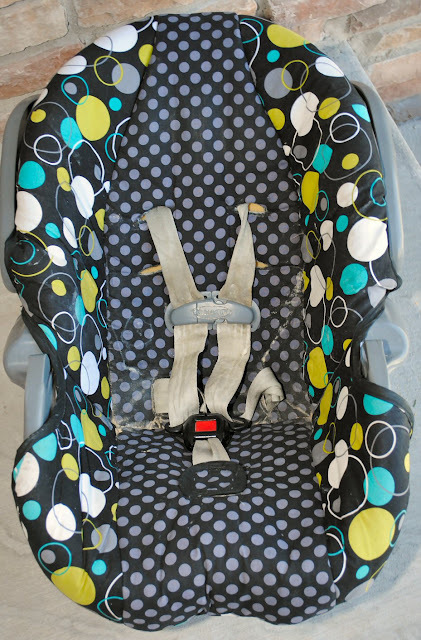 I can’t wait to do this to my carseat that I bought for our soon to be adopted daughter which will be born in august!!! Girl superheroes and pink or purple jot sure yet !!! I just found out I’m having a boy and I can’t wait to try this! I already had a girl so instead of carting him around in a bright pink car seat or having to buy a new one I’m definitely going to try this. 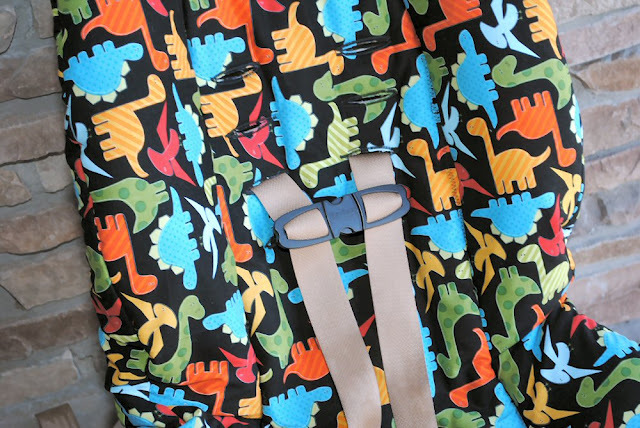 Quick question, I’m in love with the material you used for the infant car seat (the black one with the colored circles) and i was hoping you might be able to tell me where I can find it?? It was a Michael Miller fabric but it was over 4 years ago that I used it so I bet it was discontinued. I like this project and I love the fabric. Where did you get it? It was a long time ago but I think it is Michael Miller. Thanks for the tutorial. I was going to buy one of these at a local shop so I could figure out how to make them. I have 4 babies to make them for so it will be great!! Heading to the fabric store. Thanks again!! Love the fabric! ! My son loves dinosaurs! I have an infant carseat im wanting to cover and came across your page. Everything else I’ve found has just been the cover that goes over the top of the whole carseat. So I was so excited when I found your page! Just wanted to know if you had any step by step photos of covering the carseat? Sometimes its easier to see it being done in pictures or videos. Sorry! I did this tutorial so long ago-before I knew to take the step by steps and stuff. Not helpful I know!